File this under “It’ll Get Worse Before It Gets Better.” Construction on the Van Ness BRT (bus rapid transit) is about to start this month, changing the center two lanes on Van Ness to bus-only. One block to the east, Polk Street will also undergo construction to improve sidewalks, bike lanes, and other features. The construction is set to take place mostly during week days, so you can expect traffic congestion on both streets. And in case you make the mistake of driving on Van Ness (or just … driving), there will be no left turns. The Van Ness Improvement project‘s dedicated transit lanes will be for use by Muni and Golden Gate Transit, physically separated from “mixed traffic lanes.” There will also be new boarding islands, new traffic signals prioritizing transit, and pedestrian safety additions such as shortening crossing distances, zebra-striped sidewalks, and audible crossing signals. The SFMTA says that the Van Ness BRT “is expected to cut travel times for the 49 and 47 Muni routes by 32 percent.” Construction is expected to wrap by 2019. Update/correction: Cynthia has let us know that the bird seen above is a raven, not a crow. The headline stands, though, because I said it does. 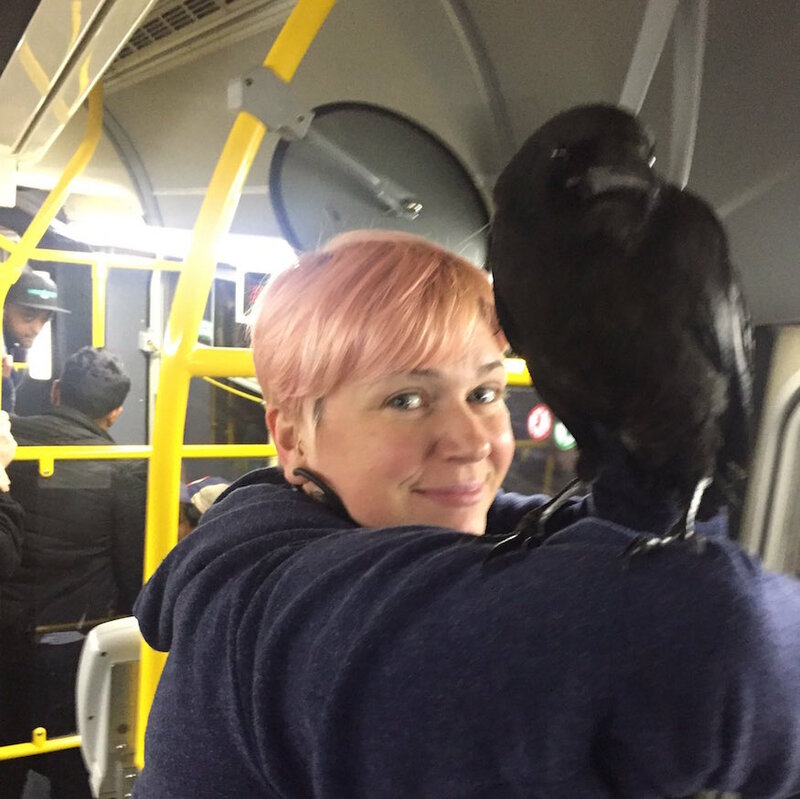 She wrote about her experience with the bird on Muni over on Medium.com. Have a read! All I can think is, What would I do/think if a crow wanted to friend me? Would it mean I was at death’s door and the bird was just biding time until he could devour my entrails? More like, WHAT ELSE COULD IT POSSIBLY MEAN? While we can’t be sure what these fellas are smokin’, we just know it ain’t cool. 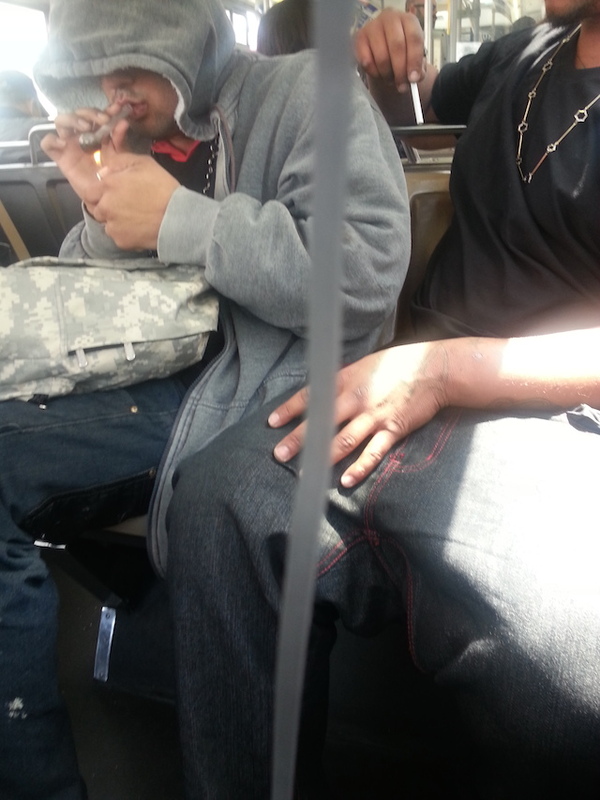 We know it’s not exactly a totally new phenomenon, people smoking on the bus. But, SRSLY? Expert Muni rider Beth knows what’s up (spoiler alert, it’s usually not good) when you hear a banging bottle near you on the bus. 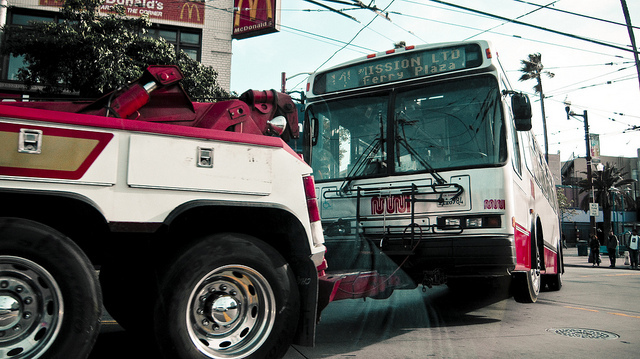 My partner and I were riding the 49 north into the Mission recently when a handful of teenagers got on the bus. We were sitting near the very back, and one of the teens went to the window behind me and overhead and began banging on it. At first, I thought he was just trying to get the window open, but when I looked, I realized he was banging the top of a liquor bottle on the window frame. I cringed and ducked, just hoping he wouldn’t shower me with vodka and broken glass. Meanwhile, one of his friends was trying to convince him to stop, while another one was offering pointers, but the kid insisted he knew what he was doing. He must have been right, because eventually I smelled liquor and figured he’d gotten it open. They got off the bus at the next stop, taking their little party with them. 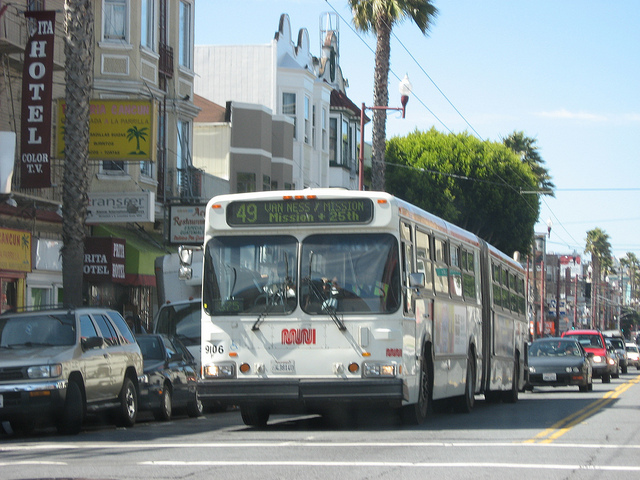 The 49 is full of surprises, be it Muni uberfan John Waters whenever he’s in town, a dispute over air quality (seriously), or literal pillow talk. What has the 49 gift horse sent you lately? People collect things. It’s one of the things people do. It’s fun, and sometimes borders on sickness. Grace collects things she overhears in San Francisco. 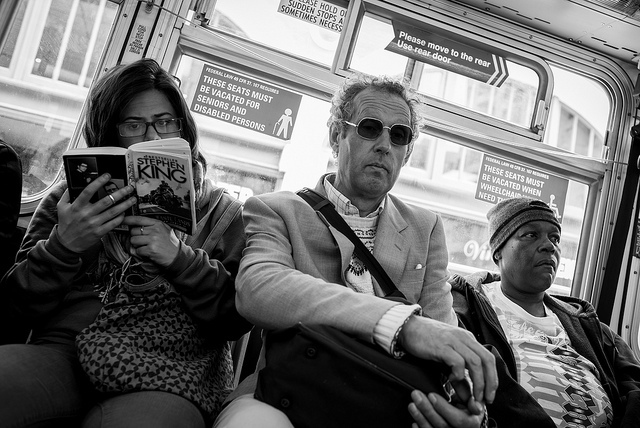 She alerted us to the special room in her house of overheards: Overheard on Muni. Naturally, we bought in. Woman: Hey that’s knitting she’s doing! My Dr. says I should learn that cuz it’ll relax my mind, also I need to find an AA meeting. There’s an important score to settle here, folks, and we need your help. No official tally has been taken yet, although we saw some creative and entertaining responses. Karen says, “The things I’ve seen in 14 cannot be unseen.” It’s fair to say that the 14-Mission leads the pack, with the 19-Polk perhaps a bus-length behind. We cannot complete this survey without putting it to a vote here. So, tell us who you’re putting your money on. And if your answer is “other,” let us know which route you’d choose.